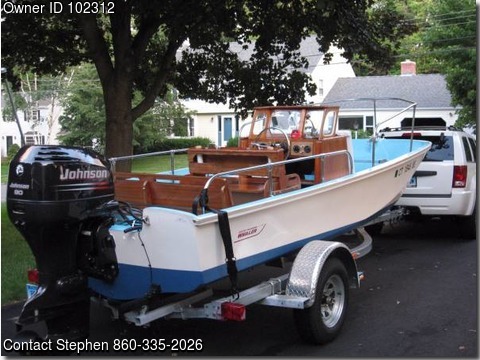 Boat is located in South Windsor,Connecticut..Please contact the owner @ 860-335-2026...1967 Boston Whaler Sakonnet Hull number 36717, with a 2006 Johnson J90GLSD s/n 05120949, 90 HP, 2 cycle, purchased in May 2010. 40 hours. Boat is sitting on 2010 Tidewater model TB2450, serial # 45LBS171XA2084544. The motor was installed by a authorized Johnson dealer in June 2010, along with custom chrome steering wheel, depth gauge,2 six gallon tanks, battery and case,tachometer bilge pump,fuel line,stern light.<>The Boat is always kept inside and has not been fished.Hard to find this model.Have all receipts for work I did.